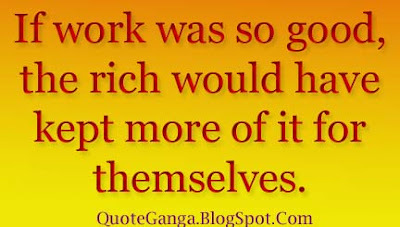 "If work was so good, the rich would have kept more of it for themselves." You think you can see the light at the end of the tunnel, but it’s only some bugger with a torch bringing you more work. If at first you don't succeed, remove all evidence that you tried. The reason I put “If it’s in you, I’ll find it” is, if I waste good time and money looking for it, and see it’s definitely not in you, I don’t wanna be sued ‘cos you haven’t got it, so, you know, not gonna get me on that.